Oil on canvas, 24" x 34"
I'll be direct posting to the blog until my server problems are solved. 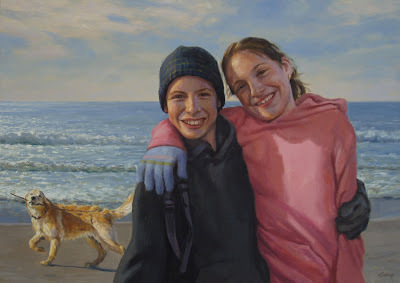 This is a commissioned portrait for a family in the Cape Cod area. 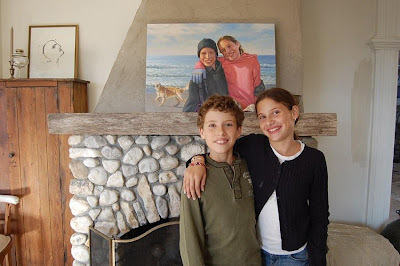 I shipped the completed painting off, and a week or so later received this wonderful photo of the twins in front of it. Click images to enlarge. Good grief what a TOTALLY STUNNING portrait! I love the palette, the energy and sincerity in this portrait Don! Oh my goodness,your lucky clients to have commissioned you WOW! This is so beautiful it's worth owning even if you don't know the kids lol A happy image, it will cheer the coldest day of winter! BRAVO! Whoa - a beautiful piece. I expect the parents were crying when they saw this. Great piece, Don. "Scout," really adds to it as well. Nice touch. Seriously, thanks so much for your supportive comments. Hi Brian, thanks for the kind words. No way - I speak the truth! Even the dog's stick is smiling!! Great job! So excrutiating to work from photos, and you do it so expertly! Now, how about a painting of that top photo?? A double double portrait! I love that little painting with upturned head over to the left side! Very nice--looks relaxed and real!